Yesterday, before a crackingly good thunderstorm knocked out power in Roxbury, CT, for more than three hours, The One went out into the garden (well, the euphemistic garden because its no bigger than a toddler’s wadding pool) and gathered our first tomato harvest. A total of 18 cherry tomatoes; 20 if you count the two we ate. This is the fruits of our labor after weeks of carefully plucking off suckers; talking to the plants, telling them as Marlo Thomas told all of us, that they, too, were “free to be you and me”; staking them; and generally doting on them as much as we do our two cats? I know they’ll be more, but I remember when I was a kid and my father would bring in bushels of globe tomatoes every few days from the garden. (Not to mention corn, potatoes, peppers, kale, cabbage, peach, pears, and three kinds of apples.) 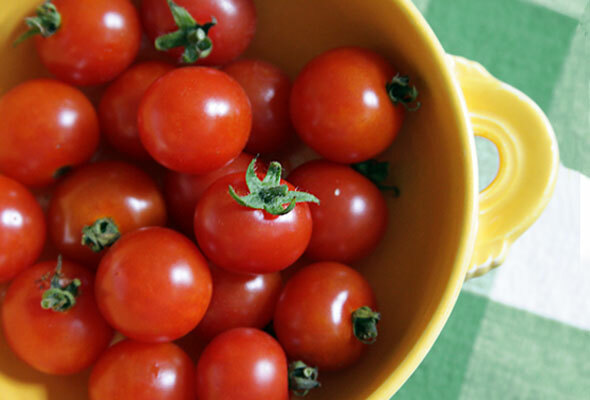 There were so many tomatoes, I was instantly dispatched to bring bagfuls to my aunts and uncles, our neighbors—anyone, in fact, in a 10-mile radius who liked them. The weird thing is he reaped that bounty from something like five plants. So I figured our three four-foot-tall plants would bless us with more fruit this summer than we would know what to do with. But, no. There’s barely enough in this batch to make a hostess gift for our friend, Ellen, who’s creating a lakeside dinner for a bunch of us tonight. And even as I write this, The One just devoured three more. The euphemistic garden, though, hasn’t been a total waste, and my father would be proud. There are bunches—nay, shrubs—of parsley and basil. I can’t make enough chimichurri sauce and pesto to keep up. The nasturtium is going berserk, and the thyme is doing well, too. Only the cilantro died a untimely death (partly because I drove over it with the lawn mower), which is unfortunate as it’s such an important ingredient in Portuguese cooking. So now I have to grit my teeth as I buy little non-biodegradable Styrofoam packets of the stuff at ShopRite for a mini fortune. But the tomatoes. Our luscious-looking little globes of sweetness. There are now only 13 left. (My bad.) I fear you won’t make it to lunch. So I’ll sit here, a kind of desk-side vigil, as you slowly slip away. Well, are slowly murdered by two hungry souls who are too tired to find a befitting end for you: a cherry tomato–goat cheese tart, perhaps? Or a raw cherry tomato-garlic sauce for fresh pasta? Not even a simple cherry tomato–feta cheese salad? We may not have honored you, you pathetically small yield, but, damn it, we certainly have enjoyed you. Luscious photo, fine play-by-play, both leading to my virtual enjoyment of your harvest. Thanks! What a beautiful photo! And I believe they taste best right out of the garden. I have a wonderful recipe for a pesto-hummus that uses basil and it’s the major reason I grow basil. Let me know if you’d like me to send it. David, I loved your tomato post. Don’t despair. If your tomatoes survived the blight at all, they are likely to keep producing. My tomato jungle (I let it get seriously overgrown) offered up only 10 ripe cherry tomatoes for about the first two weeks. Now I am harvesting 2 dozen or so daily. They seem to have the same fate as yours. Before I get any further than imaging the lovely tomato tart we’ll have for dinner, they disappear. Martin pops a couple in his mouth each time he walks by the bowl. I am likewise guilty. But that’s what a home garden is all about. Whatever way you enjoy them, it’s all good. It has not been a tomato friendly summer here in CT. I pulled two cherrys from the one bearing plant of the three I planted. I’ve never seen a summer like it. Yours look luscious! Emme, there’s a blight in the area, but it seems we’ve been spared. We did get another small batch yesterday, which we quickly sautee in olive oil along with some garlic, tossed with pasta, and threw in handful of chopped basil from the garden. A truly fresh tasting lunch. I ended up planting seven tomato plants this year, and we’re bringing in just enough tomatoes for us to eat. I canned two pints of chopped tomatoes just to see how they’ll come out. Leanne, your combo sounds lovely. We did something similar with tomatoes we harvested several days later. We made a garlic-infused olive oil, added cherry tomatoes halves to cook a bit and caramelize, and toss the mixture with pasta and a chiffonade of fresh basil. Salt, pepper, and some grated Parmigiano-Reggiano finished it off. Simple and fresh. David, great post, I loved it. But, guess what? My copy of “The New Portuguese Table” cookbook just arrived! It’s gorgeous and I’m so excited. I can’t wait to try the Azorean Kale, Sausage, and Bean Soup. I have so much kale right now. Oh, oh, oh—this is perfect. It’s wonderful, David! I wanted to send it to you to have you sign it and spell my name wrong like you did with Renée’s copy, but I’m not sure I want to let go of it long enough to send it to NYC and back. I don’t think so. Melissa, so glad you got the book and like it. That soup is my momma’s, and she’s been making it for more than 50 years. Tell me what you think. And NO more misspelled named in book inscriptions. Melissa, so glad you got the book and like it. That soup is my momma’s, and she’s been making it for more than 50 years. Tell me whaty you think. And NO more misspelled named in book inscriptions. David, seriously, the more I look through your cookbook, the more I like it. It’s interesting—when your diet does not include wheat, it’s sometimes difficult to use “regular people” cookbooks. Because your recipes are “from scratch” with fresh, whole ingredients, very few of them contain gluten to begin with. This is naturally a predominately gluten-free cookbook. Plus, the ones that contain flour are easily adjusted. For example, I’m going to try your rissois de carne with an amaranth flour blend and see how it comes out. Anyway, just wanted to reiterate how wonderful this book is. Congratulations and well done! I’m not much of a gardener, and the few times I’ve tried to grow cherry tomatoes, the yield was pathetically small. I think the squirrels were getting to them. But, damn, they were sweet lil’ ‘maters. They never made it into the house, because I gobbled them straight from the plant.